Belle Vue Terrace, meaning beautiful view, was built after 1843 (the terrace isn't shown on Bidder's map) but before 1886, when it appears on the Ordnance Survey map of that year. Meaning 'beautiful view' this was probably something of a misnomer even at the time they were built as the houses simply looked across Mudford Road to the front garden of Hollands House which was surrounded by trees - so the view would have been pretty much like it is today. 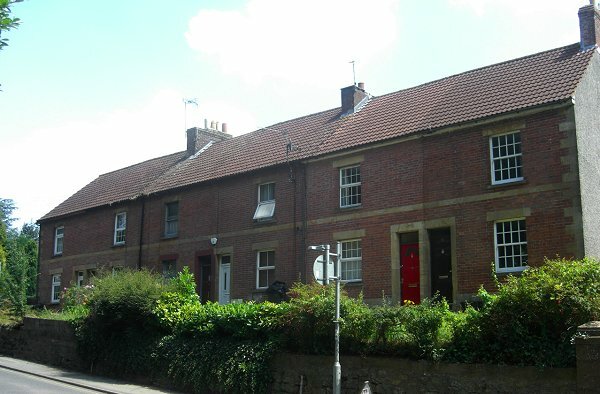 The rather plain terrace comprises six dwellings built in red Yeovil brick with Ham stone door surrounds, window heads and a continuous string course. The roofs would originally have been Welsh slate but all the houses are now tiled. The two southern houses (at right in the photo below) appear to have retained their original sash windows, complete with glazing bars, making a much more pleasing elevation. 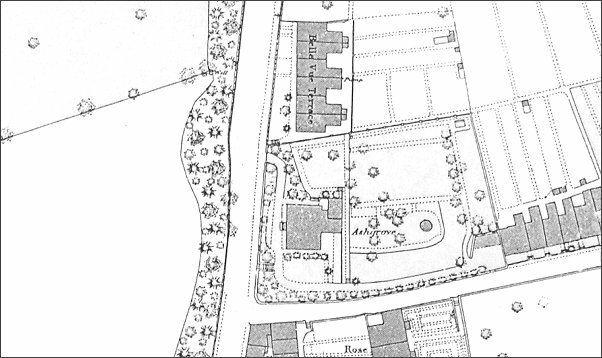 This map, based on the 1886 Ordnance Survey, shows Belle Vue Terrace at centre top to the immediate north of Ashgrove with its extensive landscaped grounds at centre, on the corner of Mudford Road (running vertically left of centre) and Sparrow Lane (now Sparrow Road) running off to the right. Belle Vue Terrace, Mudford Road. Photographed in 2014.